Troma! 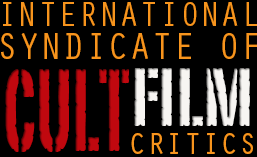 If we’d started the ISCFC 15 years ago, these reviews would have been 90% Troma movies. For the uninitiated, Troma are famous for making amazing crazy low-budget movies (the “Toxic Avenger” series, “Sgt Kabukiman NYPD”, and “Terror Firmer”, among many others). They’re also “famous” for buying the rights to seemingly thousands of awful cheap movies from all over the world, repackaging them, giving them misleading titles and selling them to people like me. Examples? “Zombie Island Massacre”, where only the world “island” is correct; and “Rabid Grannies”, where the titular characters are neither rabid nor grannies. 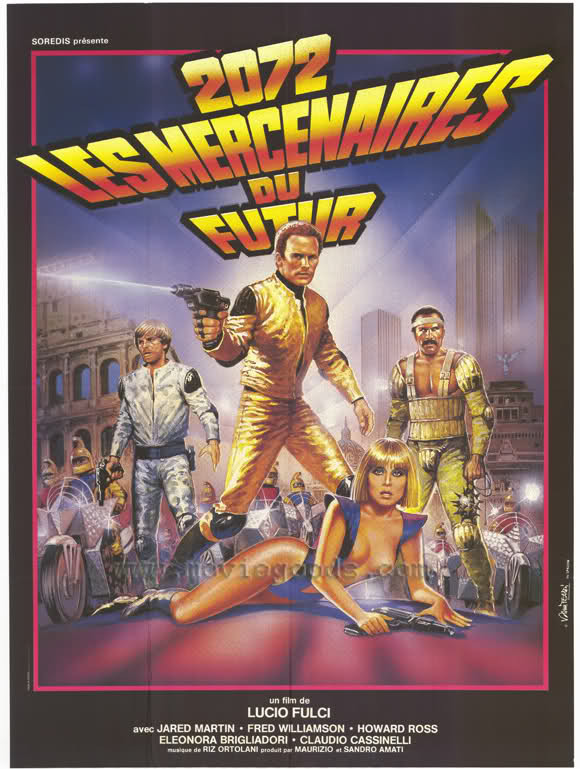 This, on the other hand, has a reasonably accurate title, despite it being released round the world with several different names – “Rome 2033 – The Fighter Centurions”, “Fighting Centurions”, “Rome, 2072 A.D.”, “The New Gladiators” and “Warriors of the Year 2072”. It also has Lucio Fulci for a director, much more famous for his gore-drenched horror “classics”, but willing to turn his hand to anything. What it also has is rather a confusing timeline, but more on that later. Fans of the old, good “Rollerball” and the new, good “Death Race” will recognise a lot of this. 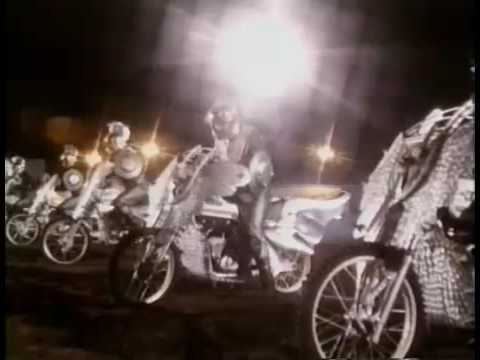 The TV show “Kill-Bike” is no.1, where guys on bikes kill each other; in second place is a show which makes people hallucinate extreme torture, impending death, etc., and if they panic, they lose. The network behind this show, “The Danger Game”, realise it’s a stupid idea about five minutes after the people watching the film do, and decide on a new tactic. Get people from Death Row, take them to Rome, the home of gladiatorial combat, and get them to kill each other. Nice! Here’s where things get a bit odd. The computer brain that runs the TV network behind the New Gladiators show (which operates its nerve centre from what looks like a flying Christmas decoration) demands a popular hero for the audience to cheer for, so…they murder the wife of the “Kill-Bike” champion, Drake, then kill the people who killed her and pin their murders on him, so he goes to jail and is eligible for their new show. I could just recap the entire lunatic plot of this movie and it’d be an entertaining review, but I don’t want to spoil it for you too much. I was under the impression that this new gladiatorial show would involve just man on man combat, given that, even when this film was made, boxing was vastly more popular than anything involving motorbikes. But no! They’re still on bikes! I think, given it looks identical, that the Kill-Bike producers would be on the phone to their copyright lawyers, especially how this show stole their star, but no. There’s a whole conspiracy thing going on too, but the moment when Drake is given a computer chip which, when swallowed, gives you the power to melt through walls (!) and mess with any electronic device you like, is when I stopped taking this film seriously. The last chunk of the film is a big battle, and if you’re an epileptic you’ll at least have a reason to have stopped watching it by this point (there’s a lot of strobe lighting effects). If you like knowing who is fighting who, you’re out of luck, my friend, as the screen is thick with engine-smoke, and everyone looks exactly the same (bikes are identical, helmets are identical, it’s just the tabards that identify people). It’s a strange one, this. Fred Williamson, as a tough-but-fair fellow gladiator, is always fun to watch, and Drake is decent too, but everyone else has to either combat being a rubbish actor or being dubbed really badly. Plus, they have to combat being in thisbonkers movie. I’m convinced this was heavily edited before release. 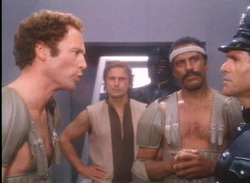 If you think about it, the order of the scenes makes no sense – Drake goes from being a famous kill-bike rider to a convicted murderer; then is given psychological testing to see if he’s prepared to take part in “The New Gladiators”, and he’s so unwilling to murder anyone that he nearly jeopardises the entire enterprise. But he’s the multiple-time champion of a TV show where he has to kill people! Then, later, he does take part in the show, which is virtually identical to the show he left. I’d lay good odds on this film initially having a rather different plot and going through some last-minute changes – Fred Williamson’s disappearance towards the end of the film lends credence to this idea. Anyway, it’s a complicated one. It’s packed with plot, even though not all of it makes sense, and features a lot of “typical Fulci” – closeups of eyes and scenes liberally drenched in gore. TV is so awful these days (minus the real violence) that some of it appears quite quaint – the extreme training the gladiators go through would be televised as a run up to the big battle at the end, for one thing. I appreciate that films as odd as this were ever made, without being terribly pleased at having seen it. If you’re desperate for a film with a largely similar plot, sit yourself down with Jason Statham’s “Death Race”, which is this film’s superior in every respect (apart from “scenes that feature flying control centres, done with miniature models”). This entry was posted in Reviews and tagged Fred Williamson, Lucio Fulci, Troma, why do they love bikes so much. Bookmark the permalink.